Meatballs are easy to make and easy to freeze (after preparing and before baking). 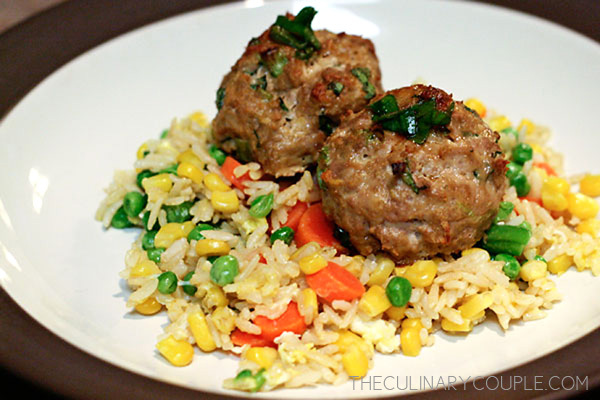 We especially like this version with ground turkey, ginger, garlic, and cilantro. Serve over a bed of fried rice or quinoa with a drizzle of lime sesame sauce for a simple weeknight meal. For Meatballs: Combine ground turkey, panko, egg, salt, scallions, ginger, cilantro, 1 tablespoon soy sauce, and 2 teaspoons sesame oil; mix well with your hands. Shape about 1/4 cup meat mixture into a ball, and transfer to a baking dish. Repeat with remaining mixture. (If you want to freeze them, now is the time to do it.) Bake until cooked through, about 15 minutes. For Dipping Sauce: Mix together lime juice, water, soy sauce, and remaining 2 teaspoons sesame oil in a bowl. Add scallions. Serve meatballs over fried rice with a drizzle of lime sesame sauce on top. I make these meatballs a lot, so great. Quick question- when do you freeze them? After they are cooked? After they are prepped but not yet cooked? Thanks!